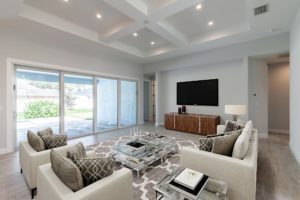 At Chatham Woods of Naples, you will find thirteen custom single-family homes, consisting of seven unique and eloquently designed models: The Newcastle, the Brookhaven, the Hampton, the Covington, the Lancaster, the Rochester and the Winston. All models have been personalized to appeal to varying homebuyer tastes, each model with its’ own unique design options and dimensions. These custom homes bring forth a timeless marriage of cottage – contemporary style and the serenity of nature, making for one of the most luxuriously private yet affordable housing developments in Naples. Experience seclusive outdoor terraces and opulent finishes, enhanced by the elegant landscaping surrounding each home. Chatham Woods offers potential homeowners a convenient Naples location, coupled with a custom-built home at pre-construction pricing. Take advantage of this ability to personalize your residence with the help of the developers at Gulfstream Homes, and set foot into the EXACT home that you and your family have been longing for. Contact Bartley Realty, LLLP in Naples to reserve your spot at Chatham Woods, and begin the journey of owning your perfect home. In today’s society we have become accustomed to customizing everything from shoes to jewelry to our cars- so what is stopping you from customizing your home? Price? In today’s market, custom homes can cost you an arm and a leg. Stop sacrificing the only place on Earth that should shout “YOU” walking into that front door… your home. Look no further, a Chatham Woods custom home won’t break the bank while still delivering your Naples dream home to you. Starting at pre-construction pricing of $502,900, Chatham Woods offers luxurious, cottage style beautiful homes located on Johnnycake Drive in the Willoughby Acres Community. Enjoy more than 2,000 square feet of living area ready for your personal touch. The builder, Gulfstream Homes, take pride in their attention to detail with remarkable interior and exterior architectural features. These beautifully landscaped properties have so much to offer. With homes ranging from three to four bedroom, two to three bath floor plans- the opportunities are endless. Stop postponing your dream- come customize your luxury home in Naples Florida. Apart from the high-quality customization and construction by Gulfstream Homes, Chatham Woods Naples offers prime locations to school zones, to one of Florida’s top ten pristine beaches and a multitude of shopping. Education is an imperative priority as families make decisions on home locations. Chatham Woods Naples is in the Collier County Public School District. Within four miles, Chatham Woods is surrounded by A Rated Schools; Veterans Memorial Elementary, North Naples Middle, and Gulf Coast High School. Looking for a private school or Charter School? Mason Classical Academy is a charter school located only 8 miles away, while there are various private school options to choose from. Naples, Florida boasts luxury living. At Chatham Woods Naples you are only twelve miles from the renowned Fifth Avenue South & Third Street South, which are decorated with four and five-star restaurants, upscale shopping boutiques, theatre, art museums & Cambier Park which frequently hosts art & entertainment events on the weekends. Just six miles north of Chatham Woods Naples is Waterside Shops, a high-end open concept mall located on Tamiami Trail anchored by Nordstrom and Saks Fifth Avenue. The mall also features stores such as Apple, Gucci, Tesla, Pottery Barn, Tiffany’s, William Sonoma, Lululemon, The Beach House and restaurants like Brio, True Food Kitchen, California Pizza Kitchen, and more. Florida Beaches are notoriously known for its warm water and pristine state, perfect for both play and leisure. Chatham Woods Naples situated six miles from Vanderbilt Beach and Clam Pass Beach Park. Vanderbilt beach is the home of white sand beaches and baby blue water. Only thirteen miles from your doorstep is the Famous Naples Pier where fireworks are often viewed on the Fourth of July. Chatham Woods Naples doesn’t just offer a custom home. It offers a serene lifestyle filled with whatever lifestyle you’re craving: Laughter and Adventure or Peace & Leisure no matter what your age. Stop Breaking the Bank and let us help you achieve your picture perfect home here at Chatham Woods Naples, Florida- luxury without the cost.